From June 30th to July 1st, BRP-Rotax brought the future into the present and started off at full throttle at the very first race of the DEKM (Deutsche Elektro-Kart-Meisterschaft). The eagerly awaited race was held on one of Germany’s most modern motorsport arenas, Oschersleben. Under the motto “Race like never before”, 17 young pilots started with the high-performance-racing-eKart Rotax THUNDeR. 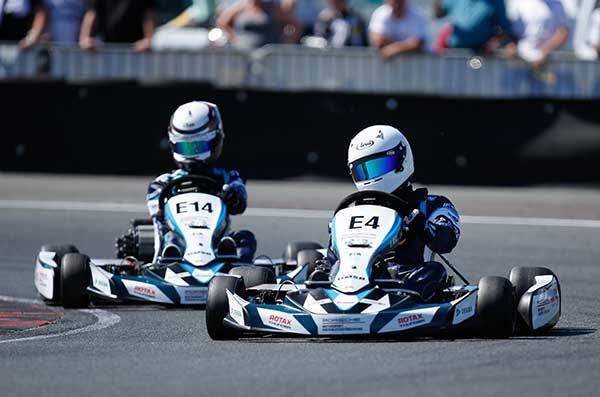 In bright sunshine, the electric-kart pioneers between the ages of 15 and 18 delivered four hotly contested races and let the numerous spectators experience a weekend of high-quality electric karting from its most electrifying side. The new Rotax THUNDeR, developed by IET and BRP-Rotax is the first electric powerpack for Rotax racing karts. It accelerates in just 3.5 seconds without emissions to 100 km/h and sets a milestone at this historical racing premiere concerning electric racing. The Rotax THUNDeR is a product of the RIC TECH GmbH. It is a joint venture of the S.M.R.E.S.p.A., a leading company which is specialized in the development of highly technological solutions within the field of electrical mobility and the BRP-Rotax GmbH & Co KG, the leader in the production and devel-opment of engines and recreational vehicles. Philipp Britz, 16-year-old young racer from Saarbrücken won the two races on Saturday. Lukas Hortsmann from Meerbusch won the second race.